"Kate Dore with frame of plant forms,"
Among the items in the V&A’s remarkable photography collection is a small portrait by Oscar Rejlander (DNB bio here, Wiki bio here) of the Pre-Raphaelite favorite Kate Dore (at left). 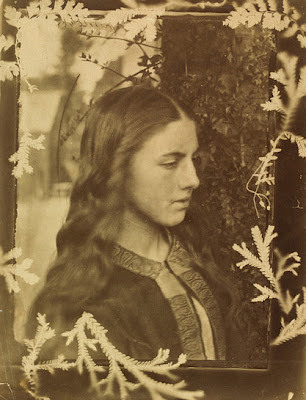 The leafy frame that surrounds the sitter, made by pressing ferns between the photographer’s glass plate negative and light-sensitive paper, was added later by Julia Margaret Cameron (DNB bio here, Wiki bio here), perhaps during a visit by Rejlander to Dimbola Lodge, Cameron’s Isle of Wight home, in 1863. It’s a striking image that illustrates a fad then at the height of fashion, one recounted with great style in Fern Fever: The Story of Pteridomania (Frances Lincoln Limited, 2012), Sarah Whittingham’s new book on the Victorian obsession with what one journalist writing in 1891 called the "tasseled, feathered, fringed, frilled, crimped, and curled" plant. It was an enthusiasm that manifested itself in the passionate cultivation, collection, and exchange of fern varieties, both native and exotic, and one that quickly developed a full panoply of related interest groups, specialist growers, and publications. The term "pteridomania" is derived from pteridophyte (a vascular plant that reproduces by spores, from the Greek pteri, feather, and phyte, relating to plants), and mania (madness or frenzy). It was coined by the clergyman and naturalist Charles Kingsley in Glaucus; or, the Wonders of the Shore (1855), his call for better science education among the young. Addressing the parents of mid-Victorian girls, he wrote: "Your daughters, perhaps, have been seized with the prevailing 'Pteridomania' and are collecting and buying ferns, with Ward's cases wherein to keep them (for which you have to pay), and wrangling over unpronounceable names of species (which seem different in each new Fern-book that they buy), till the Pteridomania seems to be somewhat of a bore: and yet you cannot deny that they find enjoyment in it, and are more active, more cheerful, more self-forgetful over it, than they would have been over novels and gossip, crochet and Berlin-wool." Yet as Whittingham convincingly shows, the passion for ferns transcended gender and could be identified in men, women, and children of all ages and classes throughout the English-speaking world. She finds examples not only in Britain, but also in the far-flung corners of the Empire and in the United States. Her material is (more or less) neatly organized into three main areas of activity: collecting, cultivation, and public display. From Fern Fever: The Story of Pteridomania (c) 2012 Frances Lincoln Ltd.
and Sarah Whittingham. National Library of Australia, Canberra. The first part of the book is enlivened by contemporary descriptions of "fern hunts," rambles over the countryside conducted with "trowel, satchel, and stout stick" in search of specimens in the wild. Whittingham's discussion of the tools used during such forays is fascinating. Tucked into bags and pockets were fern spade and hatchet, frond pattern book (for identification) and magnifying glass. The "vasculum" -- a cylindrical tin case in which the collected plants were carried home -- was ubiquitous. This was a physically demanding outdoor pursuit with a thrilling edge, and, as Whittingham notes, it could be extremely dangerous: "The overwhelming desire to find a rare fern led the hunter or huntress to lean over fast-flowing rivers, descend precipitous ravines, wade through bogs, and scale rock faces and waterfalls." In 1864 the novelist Eliza Lynn Linton recounted a gruesome accident in the Lake District. "A fine athletic young man, in the very prime of his life and flower of his strength, lost his life at the [Stock Ghyll] Force while we were there. Looking for ferns, he overbalanced himself and fell -- dashed into eternity in a second among the rocks." (c) 2012 Frances Lincoln Ltd. and Sarah Whittingham. 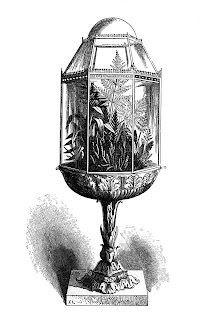 Once prised from rock or ground, a fern could be transplanted into the large glass display boxes known as Wardian cases, which became the sine qua non of the fashionable drawing room, or into the garden. In the second part of her book, Whittingham describes the varieties of these cases in some detail, along with other forms of home display and cultivation, including nurseries, "stumperies," grottos, and conservatories. The third part of the book describes how fern motifs were applied across the fine and decorative arts, adorning everything from majolica plates and pitchers to cast-iron fire grates and garden benches. The most original section here is a profusely illustrated consideration of the Victorian ferneries that were built into botanic gardens, winter gardens, and aquaria. Rounding out this useful 256-page oversized volume are extensive notes; a list of surviving and restored ferneries in Britain, Ireland, Australia, New Zealand, and the United States; an exhaustive bibliography; and a thorough index. The book is largely descriptive, an approach that will suit many readers. Others will be frustrated by its superficial analysis of the cultural and social contexts in which pteridomania flourished. The book’s colorful anecdotes sometimes feel strung together in pursuit of a point that never quite gets made. 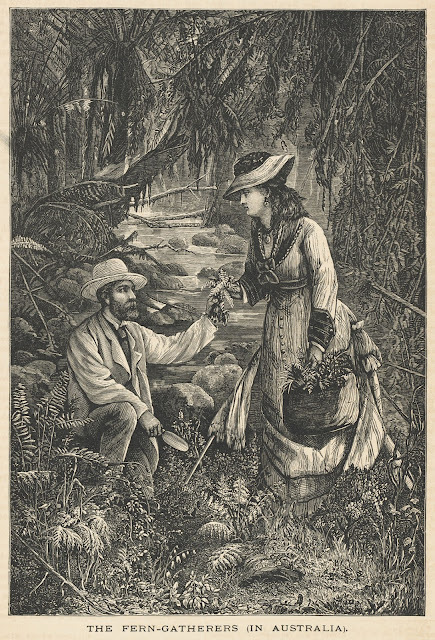 Quotes from contemporary books and periodicals might have been selected more judiciously in service to a sustained argument about the needs, desires, and aspirations that fern fever (and indeed other Victorian plant obsessions, such as those for orchids, roses, coleus, and palms) represented during this period. Advances in the nineteenth-century understanding of fern biology are cursorily treated. Nevertheless, this is a fascinating survey and one that is sure to inspire additional studies. Judith Flanders, Consuming Passions: Leisure and Pleasure in Victorian Britain (Harper Press, 2006). Catherine Horwood, Potted History: The Story of Plants in the Home (Frances Lincoln Ltd., 2007). Mary Kocol, "The Garden in Early Art Photography," Gardens Illustrated (November 2010). Peter D. A. Boyd, "Pteridomania: The Victorian Passion for Ferns," Antique Collecting 28 (1993), 9-12. As always, a wonderful post! I must say, I have a great love of ferns, although I tend to have a 'black thumb' with them. I hope to succeed with them eventually! and pond. Magnificent and very comprehensive. Fascinating! I wonder where I can find one of these ferneries in Ireland!